Aya Hijazi, Egyptian-American Aid Worker Freed In Egypt, Returns To U.S. : The Two-Way Aya Hijazi and her Egyptian husband were accused of child abuse, but human rights groups called the charges specious and prosecutors offered no proof. The couple were jailed for nearly three years. 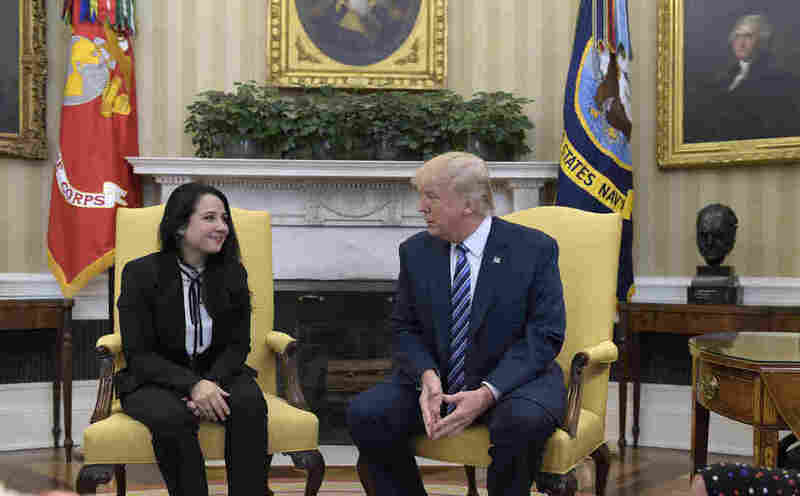 President Donald Trump meets with Aya Hijazi, an Egyptian-American aid worker, in the Oval office of the White House on Friday. An Egyptian-American aid worker and her Egyptian husband have returned to the U.S. after being imprisoned for nearly three years in Egypt, over charges of child abuse that were widely regarded as specious. Wade McMullen, managing attorney at the Robert F Kennedy Human Rights organization, has been advocating on Hijazi's behalf. He tells NPR that Sissi's visit came during a short window of time before the final verdict in Hijazi's case. During the trip, "senior administration officials were engaging with Egyptian officials on Aya's case," he says. White House press secretary Sean Spicer says Trump privately pushed for Hijazi's release. A few weeks after Sissi visited Washington, a Cairo court dropped the charges against the couple. Hijazi was released Tuesday. Now she and her husband are back in the U.S.: They arrived Thursday night at Joint Base Andrews on a military flight from Cairo, where they met Hijazi's family and McMullen. They met with the Trump family at the Oval Office of the White House on Friday morning. "We are very happy to have Aya back," Trump said after the meeting. 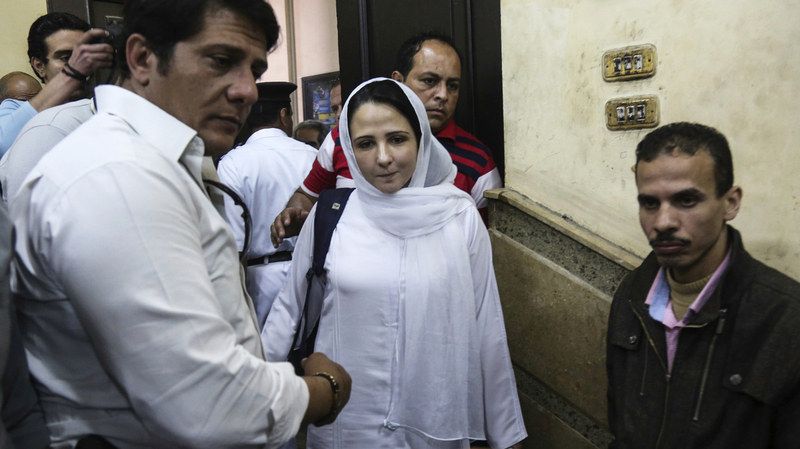 Aya Hijazi (center), a dual U.S.-Egyptian citizen, was acquitted by an Egyptian court on Sunday after nearly three years of detention over accusations related to the foundation she and her husband ran, dedicated to helping street children in Cairo. A graduate of Virginia's George Mason University, Hijazi moved to Cairo with her husband, Mohamed Hassanein. In 2013, they launched a nonprofit, Beladi, that cared for and educated street children. They were arrested in 2014 and charged with abusing the children in their care. Prosecutors never proved their case. The trial was repeatedly delayed, extending Hijazi and Hassanein's time in prison. Hijazi's mother told NPR the charges were completely unfounded. "She was very strict about no slapping, no beating, no cursing, no cussing of these kids," Naglaa Hosny told NPR's Leila Fadel in 2015. And she did not allow any of the volunteers to call them awlad shawaraa — street kids. She told them they are awlad beladi -- the children of my country." When Hijazi, Hassanein and five other people were arrested, Hijazi was hit during her interrogation. "She did not cry," Hosny said of her daughter. "She's a tough one." But when authorities read the accusations of physical and sexual abuse of the children, "that's when she started crying." Human rights groups said the charges were unfounded, and that the arrests were part of a crackdown on nongovernmental organizations. "A government forensic report provided by Hijazi's lawyer concluded there were no signs of sexual abuse when the children would've been at the shelter," Leila reported in 2015. Years passed and the couple remained in jail, without a trial. "The international human rights group Human Rights Watch says witnesses for the prosecution disappeared or recanted, and [Hijazi] was never even allowed to meet with her lawyers privately," NPR's Jane Arraf reported earlier this week. In November, the case finally went to court. The couple's Egyptian legal team "completely eviscerated any shred of doubt" about their innocence, McMullen says. The charges against them were dropped on Sunday. The couple are now back with Hijazi's family in the U.S.
"As you can imagine they're overjoyed, they're stunned," McMullen says. "These last 72 hours have been understandingly overwhelming but they're in good spirits ... You can just tell that their spirit is strong and no matter what come next that they do still feel strongly about contributing to making the world a better place." Jane reports that Sissi's government has shut down numerous other nonprofits, especially those that receive funding from abroad, and that many other people are jailed in similar circumstances. Hijazi and Hassanein's nonprofit, Beladi, was only in operation for a short period of time. "By all accounts," Jane says, "it actually made a difference in a lot of kids' lives." "Hassanein ... has said he wants to continue the work they're doing with these kids," Jane reports. "They have a real connection to a lot of these kids. But that looks like it's going to be very difficult, so there's been a crackdown here that's been in place for years, ever since the government here took power in a military coup. And there's a state of emergency that curtails freedom of movement, and it allows police to basically arrest people without charge. "So it's become extremely difficult for anyone not working with the government." In 2015, Hijazi's mother told NPR that after her daughter was arrested, the children she used to help are "back on the streets."